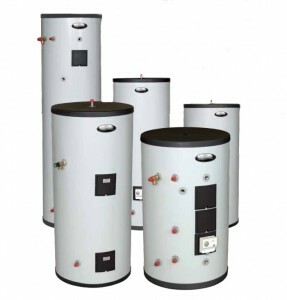 Hot water cylinders can be direct or indirect. Direct Cylinders are electrically heated with immersion heaters. The internal model already has an expansion vessel and space inside the cylinder, saving time on installation and taking up less space. The external model has a separate expansion vessel, which is fitted onto the pipe work by the cylinder. The direct unvented cylinder is heated by two 3Kw electric immersion heaters fitted into the side of the cylinder. However, when connected to the mains pressure cold water supply, equal high pressure hot and cold water will be at your disposal. Indirect cylinders are connected to a boiler or alternative heat source through a coil fitted into the bottom of the cylinder. This coil transfers the heat produced by the boiler to the water in the cylinder, giving excellent hot water recovery performance. Indirect cylinders have an expansion vessel/space inside them already, which saves on installation time. When connected to the mains pressure cold water supply, it will give equally high pressure water at both hot and cold outlets. Self-descaling – the corrugated walls vibrate in response to pressure variation and prevent lime scale deposits from sticking. Optimal insulation – the SmartLine is thermally insulated along its entire surface. Download our information sheets for more information and comparison details on the above products.